ON THE STANDARDS OF THE 36TH PROUDLY INSCRIBE "VELLETRI"
The last barrier to an Allied entry of Rome loomed ahead - a line pinned on Velletri and Valmontone. The 34th and 45th were attacking west of Velletri while the town itself was under seige by the 36th. On May 27, the 36th was committed to form a line astride Highway 7 at a point three miles northwest of Cisterna. The original plan called for the 141st to swing around to the east and the 143rd to attack Velletri frontally. Meanwhile, the 142nd followed in Division reserve. For several days the enemy held fast to his positions against repeatedly strong attacks. West of Velletri, neither the 34th nor the 45th had been able to make any decisive gains while the 143rd had accomplished very little in its assault. However, the 141st on the east succeeded in severing the Velletri-Valmontone road and had swung around to the north. Here were grounds for a new plan, submitted by General Walker twice to higher headquarters before it was accepted. When it was, only a minimum of time remained in which to carry it out. Attack orders were issued at 1630. The Regiment selected for the mission, the 142nd, had to move twenty miles by motor in order to get into position for the jump-off that same evening. The night of the 30th was to break the lock before Rome, Col. G. E. Lynch's 142nd delivering the first blow, the most important phase. Under cover of darkness it was to pass through the 141st and infiltrate deep into enemy territory getting up on Mt. Artemisio behind Velletri. At 2255, under the pale light of a new moon, the 2nd Battalion led off and by 0130 had crossed the Velletri-Valmontone highway. On their left, men heard the steady exchange of machine gun fire where the 141st was keeping the enemy engaged. Just as the first streaks of gray dawn broke through, the head of the column made its way up the slopes of the objective. There had been no opposition, not a shot fired. It wasn't until 0800 that the enemy was awakened to what had occurred, and even then, he underestimated the strength of the infiltrating force. The 143rd, coming in behind, secured the east end of the Artemisio ridge while the 142nd, continuing on, hurriedly pushed to complete the hold on the entire hill. German counterattacks were fierce but without avail. The 141st, in the flatland, went on to attack Velletri. Velletri fell the following day. Hundreds of prisoners were rounded up. German dead lay among the ruins and loss of materiel to the enemy was extreme. The German line before Rome now folded but there was further fighting over the Alban Hills and around Lake Albano. On Mt. Cavo, last resistance was offered by a group holed-up in a walled castle. The gateway to Rome was open. The City of Velletri lay white and lovely, like a brooch of old gold, strung along the highway which held the town nestled in the breast of the Alban Hills. 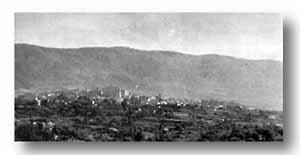 Velletri faces to the south; it is an ancient town, and Nero once sent his favorite mistress into exile there, but the tired and dirty men of the American 36th Division didn't know about that and they wouldn't have cared. They had been dug in the vineyards before the town for several days, harassed by snipers and machine guns around them and eighty-eights from the German batteries above Velletri. They had to take the town somehow, they had to break the highway-railway defense belt here because these slopes formed the last German breastworks defending Rome. They were getting nowhere very fast; nor was the 34th, faced with the same problem just on their left. 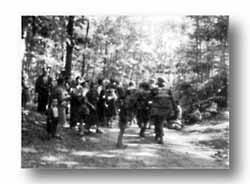 Further to the left, the 1st Armored was being badly shot up trying to get around the hills, and over to the right the 3rd and the Special Service "Commando" force were moving very slowly upon Valmontone in their attempt to skirt the hills on that side. Somehow we HAD to take the heights dominating this semi-circle of futility. 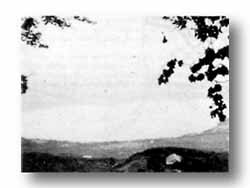 Early on May 31, we learned back at Anzio that a totally unexpected thing had occurred, that two regiments of the 36th had silently pulled back from their frontal assault, had circled around to the right by side roads and had climbed the two-thousand-foot height behind Velletri before the Germans were aware of it. It was a gamble. If the Germans could close their lines again, these men might be lost. If not, we had surely turned the key in the lock of the great door barring us from the Roman plains and the capital. By noon, Carl Mydans of LIFE and I had tracked down the advance CP of the 36th, which consisted of several bearded officers squatting under a railroad trestle studying a map. Two Regiments infiltrated at night up onto Mount Artemisio Ridge to break German line at Velletri. Major General Fred Walker, the Ohioan commanding these Texans, strode back and forth, speaking to no one. He had twice submitted this plan to Fifth Army before it was accepted. Hitherto the Italian summer campaign had been a straight-away, bludgeoning business of hammering frontally with our overwhelming superiority in guns, bombs and men. Nothing really subtle had ever been tried and this, like most subtleties, was risky. I remember my friend Lt. Col. Hal Reese, Philadelphia businessman and Inspector General for the Division, smiling at us as he drew a map with his cane in the dirt to illustrate the route we must follow to mount the hill -- "if you get by the snipers." Reese was a cultured, charming gentleman, who had served closely with Walker in the last war. He was one of so many Americans of advancing middle age who bore the physical hardships without murmur, who had nothing to gain and everything to lose by going back into uniform -- one of those non-professional, civilian reservists who provide an indispensable balance wheel of experience, humanity and common sense to every combat unit. He waved his cane at us as we pulled away. it was the last time I saw him alive. A husky young major with a full pack hitch-hiked a ride with us. He was John Collings of Detroit, who didn't know the route either, but who had to find his new outfit. He had just come from the Pacific. We left the highway, bumped across the rail tracks and thumped our tortuous way up a newly cut trail among cornstalks and vineyards. Only a jeep could have done this, but there were sharp descents and sudden upthrusts where we thought the jeep would go over on its back. It was very silent. The sun filtered down through the thick brush and trees. Then a lone sentry stepped out, "Watch for the snipers, sir," he said casually to Collings. Freddie, our driver, looked back at us, a question on his face. He had orders from his colonel to drive only as far as he considered it safe for himself. With a careless gesture I cannot forget, Collings flipped out his forty-five, held it cocked in his hand, kept his eyes steadily upon the trees and said, "Go ahead driver; snipers aren't so bad." A machine gun began to sound nearby, like corn popping in a deep kettle. We could see nothing. The jeep trudged over ruts and roots and a part of approaching peasant women carrying great bundles on their heads, squeezed against the trees to let us pass, the inevitable sign of fighting ahead. We emerged again upon the highway. Three soldiers rested in the ditch. "You're visible to the enemy the next couple hundred yards," they said. Implied was: "We are alive by the grace of God; you may pass away in the next few minutes." The tone was the tone of men saying it looked like rain. It is thus, nearly always, among Americans in the face of death. The jeep darted the next stretch and was halted by a soldier who looked like a boy in his teens -- the artless, helpless type who should never be taken into the Army. His eyes were unnaturally large and his hands were twisting a towel, rapidly, senselessly. "Do you know where the aid station is, sir?" he said through trembling lips. We thought it was just ahead. "Are you hit?" "No, sir, it's my nerves, I think." Another quarter-mile and we could go no farther on the highway. Velletri lay only another thousand yards or so to the west. Machine guns were sounding again and it was sure death to proceed. Here now was the cut-off, a narrow "Jeepable" trail, mounting sharply between high banks. We left Freddie here, for his safety, which was a mistake. We began the upward hike, rounded a bend and found tanks, chugging up, their massive breadth plugging the whole cut, scraping down dirt and stones from the banks. Here you had it; this was much of the explanation why the great natural barriers of Italy could never stop the Americans. I think few but Americans would dream of attempting this and none but American army engineers could ever make it possible. For, scrambling around the tanks, we found the ubiquitous bulldozer, simply carving the trail into a road, roaring and rearing its ponderous way at a forty-degree angle upwards. The men themselves, bearded, silent with exhaustion, swung their shovels through the loose dirt and pitched it over the banks. Carl Mydans snapped his camera and, tired as they were, they would grin and adopt a comic pose for the pictures. A rifle snapped, very close at hand, and we heard the sigh of the bullet this time. The party of shovelers, stood upright. "Oh-oh," said one, and mechanically, as though they had done it a thousand times, two of them let their shovels fall, slipped their carbines from their backs and crawled over the bank, to disappear in the brush in the direction of the sniper. We plodded on. Now a jeep with the Red Cross marking tilted precariously down the trail. Strapped across the hood was a stretcher with a man upon it. His head was almost covered with bandages, only the eyes, his nose and lips were showing. The lips held a cigarette at a rakish angle. When Mydans pointed his camera, the boy turned his head toward the lens and in a steady voice, just tinged with irony, he said, "Do you want me to smile?" We pulled away from the engineers, and found ourselves now with a rifle company of a regiment which I had last visited in the fields before Velletri. They were completing the marvelous feat, their comrades ahead having already reached the crest. They had been pulled out from their old position at nightfall, gone a short way by truck, then had made a ten-mile hike around Velletri and gone straight up the mountain, carrying their heavy mortar shells in their bare hands, clutching them to their stomachs. The weighty metal boxes of rifle ammunition they strapped to their backs and they had climbed all night, silently, like Indians, forbidden by their general to have a cartridge in the chamber of their guns, He would permit no firing, to avoid alerting the Germans. Only a grenade could be used, if absolutely necessary, for the Germans would easily mistake that for a mortar shell and remain ignorant of its origin. Later, we learned the Germans believed two companies had made the infiltration, not two regiments. Now, in a sun-speckled grove the men lay sprawled on their backs, oblivious to the traffic's dust or the spasmodic machine gun fire so close at hand, catching as the veteran knows how, any moment's fortune provided for precious sleep. A soldier walked past, going down. He held up his hand to show bandages covering what remained of his thumb. "How's that for a cheap purple heart?" he commented cheerfully. "Lucky," one muttered; "he's got the war made," said another. A bare-headed Texas lieutenant no more than twenty-five was saying to us, "My major, he fined me twenty-five dollars for not wearing my helmet; now I've lost the damn thing." The lieutenant wore the Purple Heart. "I'm trying to break my record of going twenty-five days without getting hurt," he said. "Those Germans are figuring on a counterattack tonight. They're going to get surprised." Battalion headquarters was a farmhouse, and nearby lay a dead German sniper, wearing American GI boots. The lieutenant jerked his thumb toward the body. "That guy shot two of our medics.. He made me sore." Inside the house, three young officers sat at ease around the kitchen table while the farm wife, quite unperturbed, served them wine. Everything was most obviously under control. We descended, found Freddie crouched in the highway ditch, clutching his rifle. When we had left him for the climb, six machine gun bullets had whispered past his ears, and he was thinking he should have come along with us. In the night, the counterattack came and failed. Our boys clung to the heights and fired down upon the desperate Germans inside Velletri. In the morning General Walker, his tanks and men rushed the town, entering upon the highway. Lt. Col. Reese insisted upon walking ahead of the tanks and it was a shell that killed him. When he heard the news, the General averted his face for a moment. "I asked him not to go ahead like that; I asked him not to," he said. Hal Reese, I think, died content. He had felt that it was coming. In his notebook he had written, "I got through the last war all right, but I will not survive this one." And a note instructed his comrades to send his personal papers to his brother. Troops hurry to secure wooded Mount Artemisio. A German came out of the brush and walked with his hands up toward Walker. The General didn't even bother to pull out his forty-five. He was an angry man. "Go back in there and bring out the rest of them," he ordered. "I know there's more of you in there." The German nodded and turned bark. Then Walker shouted to him to stop while he sent an American soldier along. They returned in a moment with a dozen more prisoners. There was more fighting around Lake Albano. These episodes did not halt the push, and our men were into Velletri so fast they captured several hundred Germans. It was a wild and weird affair, with signal corps men and engineers taking part in the conquest. There was the single MP in a jeep to whom twelve fully-armed Germans surrendered. There was Pvt. Bernard Miller of the Bronx, a medic, who walked into seven Germans. They raised their rifles to shoot. He tore off the netting on his helmet and pointed to the Red Cross. So they surrendered to him. One Italian entered a house, immediately ran out in panic and shouted, "Tedeschi!" meaning there were Germans inside. Americans burst in and found, in the dim lit room, a large mirror and nothing more. The excited Italian had been confronting himself. The conquest was over in a few minutes. Reporters walked through the streets, prickly with shrapnel, to a house on the outer edge. Inside were four GIs, their rifles hardly cool, playing poker in their shirtsleeves while two Italian girls heated their C rations on the stove. A few hours earlier they had been cooking at the same stove for the Germans. With Velletri gone, the Alban Hill defense line was irreparably penetrated and our Divisions smashed into the disorganized Germans around to the left, down Highway Six and to the right - Rome lay shimmering and undefendable straight ahead. Many outfits deserve the credit for the whole operation, but those of us who were present will always remember the men of the 36th, climbing silently in the night behind the enemy, armed with little but their American competence and a personal faith in their quiet, retiring general who had never let them down. If Generals Alexander and Clark received the key to the city of Rome, it was General Walker who turned the key and handed it to them. Reprinted from "The American Legion Magazine" for October 1944.